Facing San Gimignano, Certaldo Alto is a small picturesque town perched on a hill between Florence and Siena, and has hardly changed since the Middle Ages. Overlooking the little streets and squares since the 12th century, is the Palazzo Pretorio, once the home of the Conti Albertis; nowadays, the palazzo is home to contemporary art exhibitions. 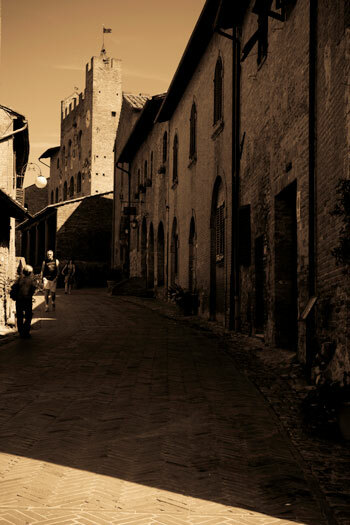 In this medieval town, you will find the house of Boccaccio; he was the famed author of ‘The Decameron’. Whilst here, you should also visit the museum of the Sacred Art, the church of St Jacopo and St Filippo, and the other grand houses and their towers, all of which are built in the splendid Romanesque style of architecture. Certaldo’s arts and crafts and the local cuisine offer you a unique opportunity to experience the beauty of tradition in an everyday setting. Certaldo Alto hosts numerous shows and cultural events of great prestige, such as the Mercantia (a medieval event and market with international street artists), and the well known”Premio Boccaccio” (Boccaccio’s Prize).